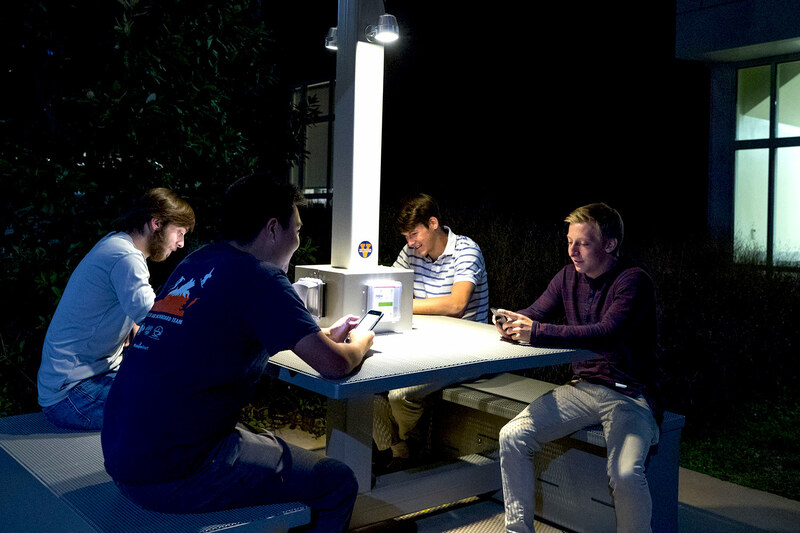 The University of Virginia’s living laboratory model has brought a solar table to Grounds, allowing students to charge their devices without carbon emissions. Prompted by a student-led class project, University workers this spring installed a CarrierClass Green Infrastructure ConnecTable solar table outside the Lile-Maupin residence hall. The table, which seats four, has a solar array over the top of it like an awning; the array charges a battery in the table, allowing students to plug their devices in for charging. “Students can work outside and do collaborative work and support clean energy on Grounds,” said Sakib Ahmed, sustainability communications coordinator in UVA’s Office for Sustainability. The idea to purchase and install the table originated from a student group project in the “Global Sustainability” course taught in the 2015 spring term by Phoebe Crisman, an associate professor of architecture. Students researched and developed a case for bringing a solar table to Grounds as a way to raise awareness about renewable energy, provide a source of emergency power and serve as an outdoor study space for students. The project was well-received during an Earth Week poster competition, and one of the group members, Tatiana Sokolova, an engineering student who graduated in May, took on bringing it to the Grounds. She joined the Open Space Working Group under the University’s Committee on Sustainability to work with faculty and staff to develop her concept, identify funding sources and find a location. The table, sold by ConnecTable of Pennsylvania, cost around $17,000, which was funded by a $10,000 grant from the UVA Parents Fund; $5,000 from the Green Initiatives Funding Tomorrow, which distributes Student Council money to sustainable projects; and $5,000 from the Facilities Management Division. The remainder of the money will be used to maintain the table. Andrea Trimble, director of the Office for Sustainability, said the solar table project is an example of students using the University as a learning tool for sustainability. This year, a new “Global Sustainability” course project is studying how to raise awareness of the table and analyzing use patterns. The 2.1-amp outlet can charge a cell phone in 2½ hours, and the 1.1-amp outlet in five hours. Morris also noted that because the table has battery storage, it can be used for up to two days without sunshine.